Battery Warehouse York Pennsylvania is a family run business with the best quality and selection of batteries in the area. Our York PA location is convenient from Shrewsbury, Crossroads, Dallastown, Windsor, Delta, Fawn Grove, Felton, Glen Rock, Hanover, Helam, Jacobus, Seven Valleys, Jefferson, Loganville, Manchester, New Freedom, Dover, Red Lion PA, Spring Grove, Stewarstown, Winterstown and Wrightsville Pennsylvania. Our York location stocks 100's of batteries and is also just a short drive from Lancaster PA.
Stop in with your battery questions and let them show you why they are #1 in Quality, Service and Price. 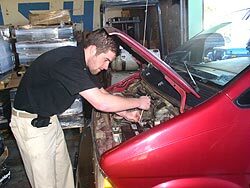 Professional battery installation is never a problem.